This year Pork in the Park is bigger than ever with 137 teams competing! Last year, more than 90 competitors from ten states vied for trophies, bragging rights and $18,000 in prizes, making the Pork in the Park Barbeque Festival in Salisbury Maryland one of the nation’s ten largest barbeque festivals sanctioned by the Kansas City Barbeque Society. 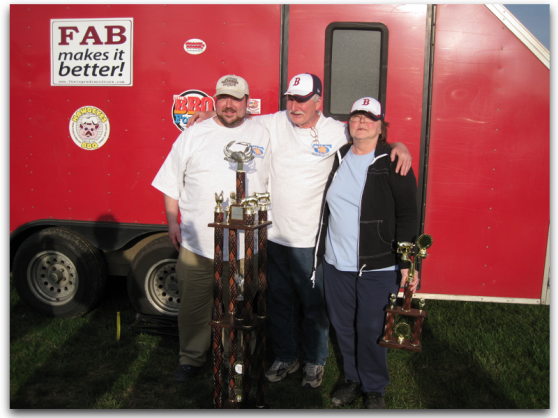 In 2009, we were crowned the Largest KCBS Festival East of the Mississippi! We’re really excited to be able to attend all three days – and we’ll be there to get some pics, some BBQ sauce and hot sauce stories. Also, we’re hoping to interview some teams and vendors for soundbites and stories for our HotSauceWeekly podcast! Last year’s Grand Champion, Hawg Eyes BBQ, will be returning to defend their title. We know a few of the teams personally, some from online contacts, and others that we definitely want to meet. Deguello BBQ and VA BBQ Pirates – two other teams from VA that we are looking forward to meeting! Todd’s Dirt will also be there as a vendor. Todd’s got some awesome products. Of course there will be tons of food vendors – rides for the kids, and live entertainment all weekend. $2 Admission: Kids under 12 Free! If you are a BBQ Team competing, or a vendor and would like us to come by for a short interview, please leave us a comment below. 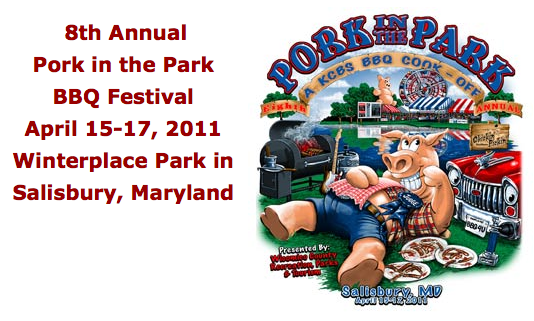 The smell of BBQ returns to the air at the Pork in the Park Festival in Salisbury, Maryland on April 15-17, 2011. Excellent. Looking forward to the coverage. Yes Brian please stop by for an interview and a tasty beverage! I might be able to come out one of the 3 days. We are having a Garden Show on Saturday in Leesburg, VA where I live, and we have the Chile Man going, and I need to talk with him. Maybe a video, who knows. Can’t attend, but would like to go some day. Hot Sauce is not just a food additive, but a way of life. Brian and Marilyn it was great hanging with you guys this week-end. From a guy used to supermarket hot sauce I can learn a lot from you guys. I’ll see you in Salisbury. Also, I want to let you know that i’m making another batch of my BBQ Sauce soon and will deliver you some. Would you like ribs with the sauce? I like your site. Come see us at Pork in the Park. We will see you there Ralph!